I was planning to move on to some projects today, but comments from readers have made me think that perhaps I need to spend a day or two more on the underlying ideas of Home Recycled. A friend commented on my Facebook page that I hadn't mentioned yard sales. I wondered if it was an oversight on my part, but I had mentioned it in terms of having them with friends and swapping furniture and knick knacks. Which made me ask myself: Why didn't I consider it when sharing what I consider to be good ideas for decorating a home on the cheap? So I gave that some thought. I thought about yard sales I've been to and yard sales I've had or that I've participated in with friends. Very few of the things I currently have in my house came from them. A great chair in my studio and an artist easel that converts to a desk, and a desk that both my kids have used and is going in the new guest cottage. Most all of the items that I've purchased from yard sales have either been resold by me or have been donated along the way. So surely I'd found some treasures and great deals, but not nearly as much is still being appreciated as I would have expected. So what's going on? After pondering I've come to a couple of conclusions. There are other more efficient ways to find what you need. 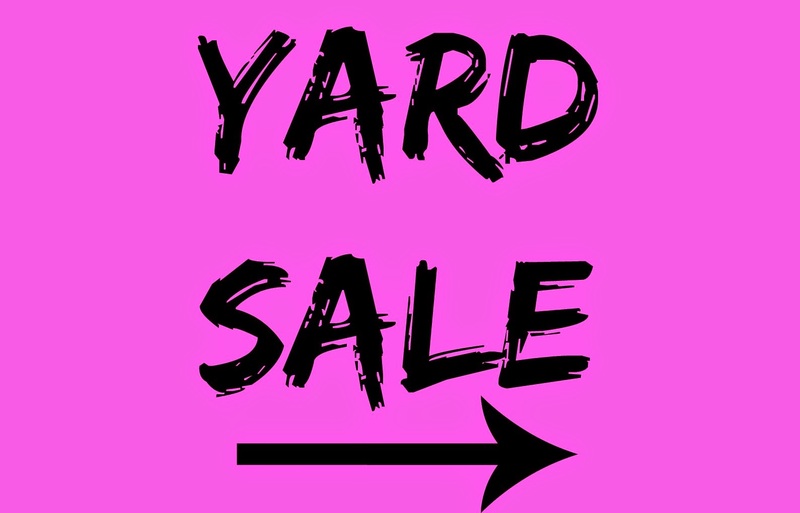 If you are aiming to optimize your time and energy yard sales aren't necessarily the best way to do that, though you can certainly optimize your spending. Especially for people with full time jobs or families with small kids thrift stores are a superior choice. I'd also advise Craiglist for larger items or things that you need to be in better condition. If you already have a problem with clutter then I'd say that they should be avoided. Do people find amazing things that they need at a great price? Every day. But I'd say that the first order of business for this series is to have a sale before you visit one. And then to think about what you actually want to put into your home. Practice being deliberate in your purchasing. Twenty bucks frittered away a dollar or two at a time is still money you don't have. Indeed the friend who asked me the question on FB said that she is using them to practice saying "no" to more stuff. She and her husband also use them for entertainment and are empty nesters who have a blast whether or not they buy anything. When I thought about yard sales in general I didn't recall the great finds, though a few came to mind. What I remembered was being in a minivan with friends, doubled over and laughing so hard no one could breathe and we had to pull over until we stopped crying from laughing so hard. I thought about all the strange and delightful characters I'd met while hosting yard sales. There were lots of memories about sharing cold mornings, sweaty afternoons, and answering the question "will it fit in the car?" Which led me to the realization that yards sales are much more about socializing, community, and entertainment than bargain hunting. I had a yard sale this weekend (remember our mothers both had a LOT of stuff). It was a lot of hard work but we made some cash so it was worth it. But the real benefit of the day was catching up with neighbors, hanging out with my husband, and the (can I just be honest?) strange and curious shoppers we had. People never cease to fascinate me. If you love to people watch, just put some junk out in your driveway on Saturday and enjoy the show. I mentioned in a previous post that I sometimes retrieve things from the side of the road. I'm not advocating spending time driving around looking at everyone's trash piles, though I have certainly made out like a bandit from time to time with a road side pickup. Everything I've ever gotten has been because I happened to be driving by and saw something. To do it with purpose would be extremely time (and gas) consuming and likely not very productive. We want to make the most of what we have and that includes our time. So load up the SUV with your girlfriends, check out the listings online, and race each other up the driveways to see who can get the best prize. You may even get lucky and find that thing you've looked for everywhere. But treat it as more of a fun hunting trip, social event, and entertainment than actual shopping and in the long run I think you'll come out ahead. This is a very interesting way to think about yard sales. I only wish I had a bunch of girlfriends to yard sale with. *sigh* the result of moving eight times. Great post! Well yard sales are great ways to get to know your neighbors, so you could stop by if anyone is having one or you could host one. One girlfriend works just as well! :) Thanks for stopping by!